Hike Woody Gap to Jarrard Gap on the Appalachian Trail, catching stunning views from Preachers Rock on North Georgia’s Big Cedar Mountain. This view-packed hike departs from Woody Gap, located just North of Dahlonega, following one of the most popular and most beautiful stretches of the Appalachian Trail in Georgia. The hike catches beautiful summit views on Preachers Rock at Big Cedar Mountain and rolls through mountain ascents on meandering trail switchbacks, wandering through wildflower and fern-filled mountain gaps in the lush, mountainous Blood Mountain Wilderness. This is one beautiful hike, filled with lush, green forest, abundant warm-weather wildflowers, and some of North Georgia’s most exceptional summit views. And the trailhead is one of the most easily accessed on the Appalachian Trail in Georgia, adding to this hike’s popularity. The trail departs from a paved highway, one of Georgia’s few AT trailheads with direct highway access and ample parking. The hike departs from Woody Gap (view maps and driving directions), catching views of the nearby rolling Appalachians from the trailhead’s overlook south of Highway 60. 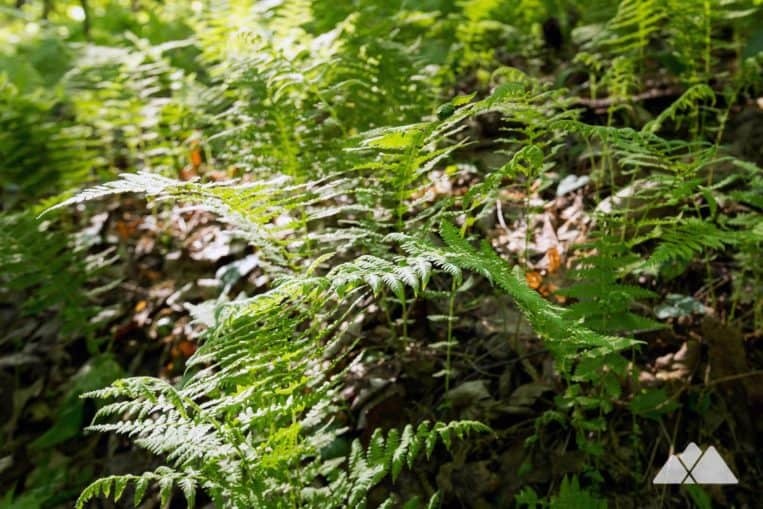 After pausing to take in the view, the hike follows the Appalachian Trail north from the gap, meandering past several trailside campsites and diving into a fern-filled deciduous forest. 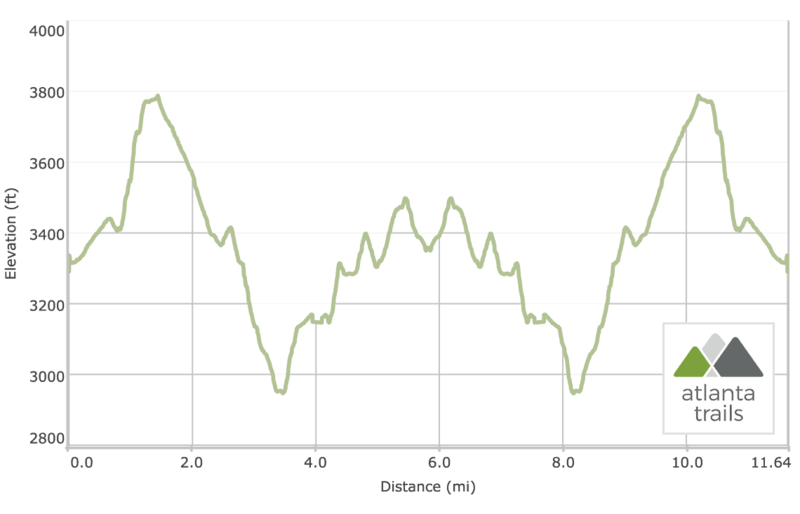 The trail steadily gains elevation through a series of switchbacks at .8 mile. The trail crests near the Big Cedar Mountain summit at 1 mile, catching stunning long-range views from the summit’s broad, exposed expanse of rock, nicknamed ‘Preachers Rock‘. The views from the rock outcrop are superb, and easily some of the best on the AT in Georgia. For many hikers, the hike turns here to return to the trailhead, a short 2-mile hike with a fantastic summit view. But the AT treks beautiful forest north of Big Cedar Mountain, worth a deeper hike into the wilderness. 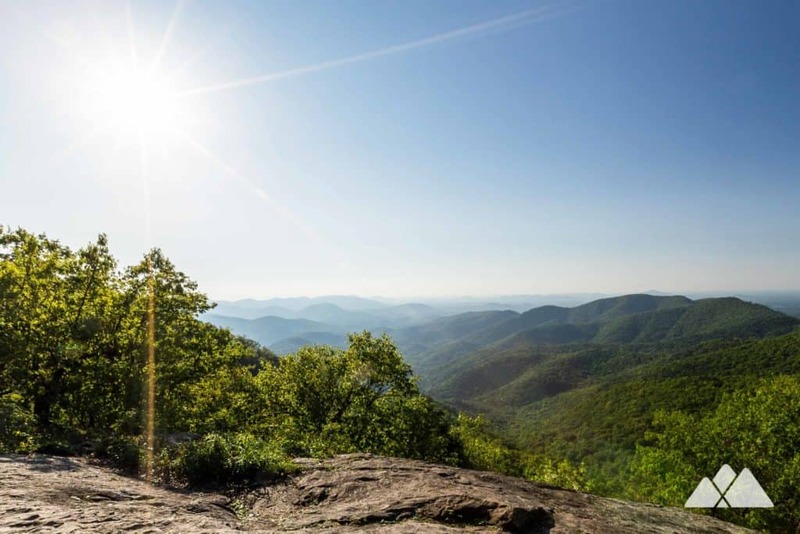 This hike departs the summit, following the iconic, white rectangular blazes of the Appalachian Trail and trailing northbound toward Blood Mountain. The trail descends elevation after passing a campsite at 1.45 miles, diving through a fern-filled, shady forest. The AT loops in a wide arc through Augerhole Gap at 1.75 miles, trailing through sharp switchbacks. Rolling mountain views emerge through the treeline in a rocky, ferny deciduous forest before the trail crosses a trickling stream at 2.3 miles. The Appalachian Trail begins a descent at 2.6 miles, passing two large campsites. The AT passes a junction with the Dockery Lake Trail on trail right and a large campsite on the left at 3 miles. The AT levels elevation, crossing Lance Creek at 3.35 miles via a wooden bridge in a beautiful foliage-filled creek valley. Level tent pads offer fantastic creekside campsites near Lance Creek, accessible via a side trail at 3.5 miles. The AT continues its northbound journey, gaining elevation as it departs the Lance Creek campsites and crossing a stream at 4 miles. The trail levels elevation at 4.4 miles, grabbing views of neighboring summits through the treeline on trail right. After passing a campsite at 4.6 miles, the trail rolls elevation through a series of wide switchbacks in a leafy hardwood forest. The trail crosses a spring just before reaching Jarrard Gap at 5.8 miles. From here, the Appalachian Trail continues north towards Blood Mountain, passing a large group campsite on the trail’s left. The Jarrard Trail departs to the left, hiking 1.15 miles to the glassy mountaintop waters of Lake Winfield Scott. 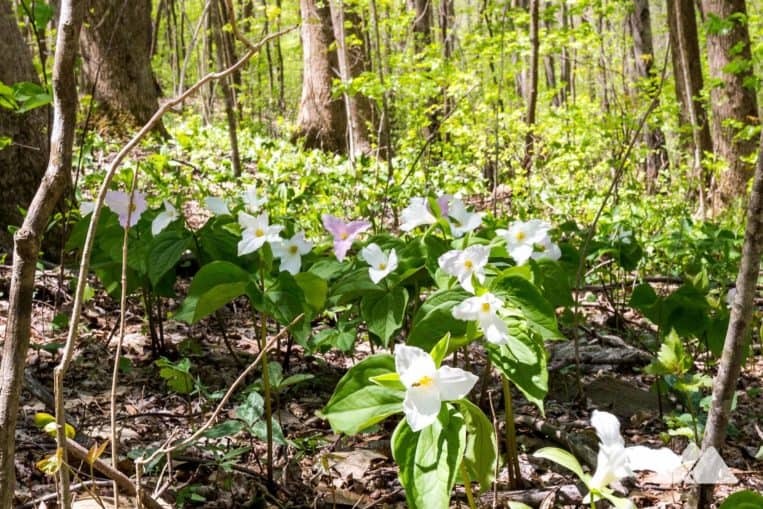 Wildflowers, including native trillium, carpet the forest floor near Jarrard Gap in late spring. 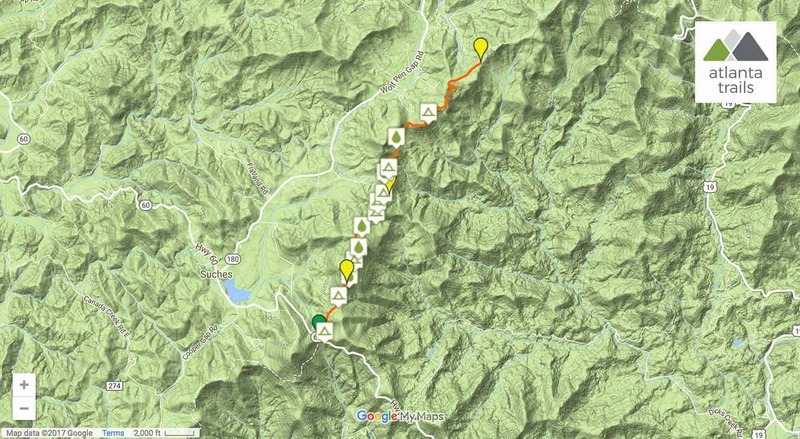 This hike turns around, hiking south to retrace its steps on the AT over Big Cedar Mountain, reaching the trailhead at 11.6 miles and completing the adventure. Excellent campsites dot this hike’s length, including campsites near the stunning, long-range views at the Big Cedar Mountain summit. Backpack to one of the many campsites along the Appalachian Trail (view the trail map for locations) – or camp at one of the sites near the parking area. All campsites on the Appalachian Trail are first-come, first-camp, so start your hike early the best pick of the campsites. The campsites are located in the Blood Mountain Wilderness, where black bear are active. Overnight food storage in a bear-resistant canister is required at campsites on the Appalachian Trail from Jarrard Gap to Neels Gap from March 1 through June 1. And due to heavy campsite use near Blood Mountain, campfires are prohibited on the AT from Jarrard Gap to Neels Gap. 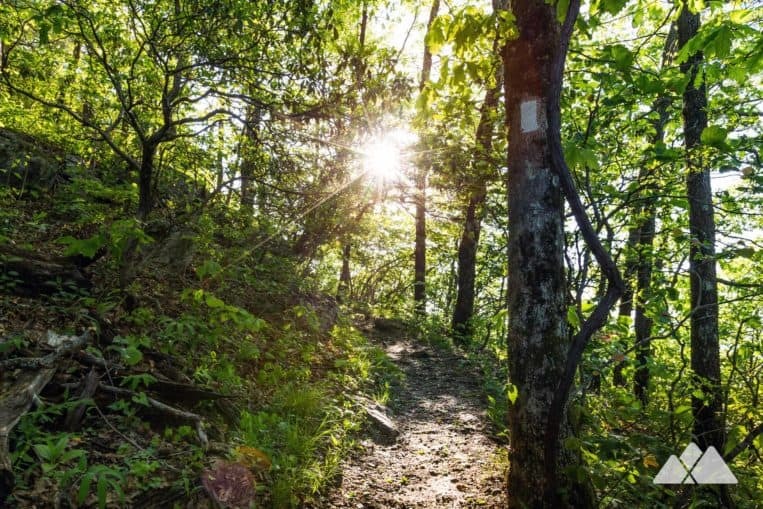 Easily add mileage to this hike, or create an overnight backpacking adventure by continuing on the Appalachain Trail from Jarrard Gap to Blood Mountain. The AT passes the Jarrard Trail and the Slaughter Creek Trail, and an intersection with the Duncan Ridge Trail, which connects to Vogel State Park via the Coosa Backcountry Trail. The AT descends from Blood Mountain to Neels Gap, and continues its northbound journey to Cowrock Mountain. And departing south from Woody Gap, the Appalachian Trail hikes to Gooch Gap, catching beautiful views from the Ramrock Mountain summit.